This is a 3/2 over-sized 2 car garage home with an in-ground caged pool located in the beautiful Golf Community of Sugarmill Woods' Oak Village. ROOF 2012 AC 2015. This home has 1882 living and 2781 total square foot. The second you walk in the front door you feel at home and comfortable. Custom built in shelving accompany the wide open living area with 8ft sliding doors that open right out to the enclosed patio and SOLAR HEATED pool. Perfect for entertaining. Formal dining space and eat in kitchen. Master bedroom also opens to patio, huge bath with walk in shower and jetted tub, dual sinks. Split floor plan with 2 guest bedrooms and pool bath. House is handicap accessible too. 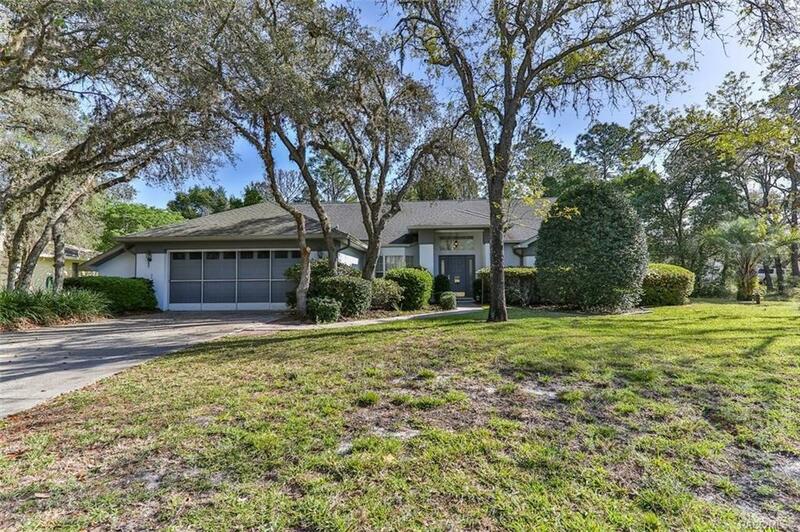 Sprinkler system, beautiful oaks, nice yard that backs up to green belt. Don't let this one slip thru your fingers. Check it out!